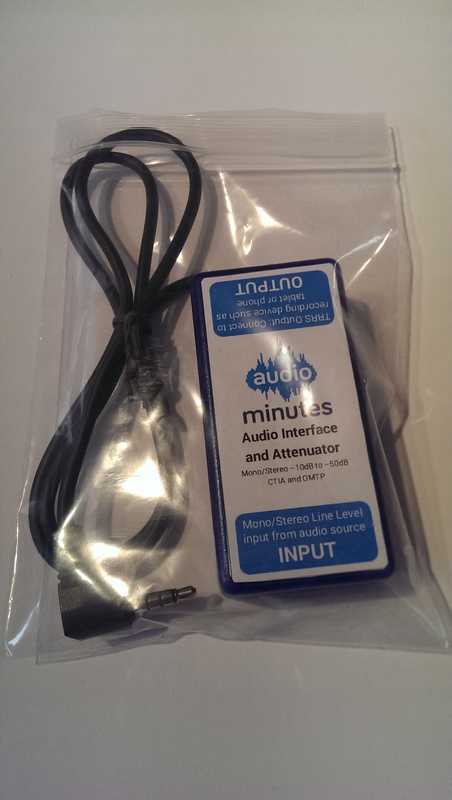 The Audiominutes Attenuator AM1 device provides an easy way to connect the output of audio devices (such as mixers, CD/MP3 players and PC sound cards) to the microphone jack of mobile devices such as tablets and smartphones. An application on the mobile device can then capture, process, record and stream the audio signal. The Audiominutes Attenuator AM1 also provides a ‘dummy load’ so that when the AM1 is plugged into the mobile device, the internal microphone is switched off allowing the audio from the AM1 to be recorded. Because of the variety of smartphones and tablets, the AM1 is designed to be flexible and adaptable to cover all common configurations and signal levels. Because microphone inputs generally use very low signal levels, the AM1 provide several switch-selectable levels of attenuation, along with other settings so it can be set for the best match between the input and output devices. There are two common ways for phone and tablet 4-pole headset (TRRS) connectors to be wired, called OMTP and CTIA (also known as AHJ). The difference between them is that the microphone input is on the connector sleeve for CTIA, but on the second ring (Ring 2) for OMTP. Most devices use the CTIA standard, so the AM1 comes set to this by default. To change this to match devices that uset he OMTP standard, move both jumper links to cover the position marked “OMTP”. SW1-4 control the level of attenuation in steps of approximately 10dB. Normally only one of these switches is on (or none for -50dB); the default setting is SW 1 on. SW5: Mono/Stereo input. Set this switch “On” if using a stereo source to mix the left and right channel signals together (smartphones and tablets only have mono inputs as a rule). SW6: Mono compatibility switch. Some mono devices designed for use with headphones are wired using stereo sockets, with the signal connected between Tip and Ring (instead of Tip and Sleeve). This is done so both mono and stereo headphones will work with these devices; however it means that it is necessary to ground the ring when connecting to other equipment. For these devices (typically conference mics), set this switch to the “On” position to connect the input socket&#39;s ring to ground. SW7/8: Dummy load for tablet/smartphone headphone jack. Some tablets don&#39;t detect external connections unless there is a small load on the left and right outputs. Setting these switches “On” provides this load (default is On).